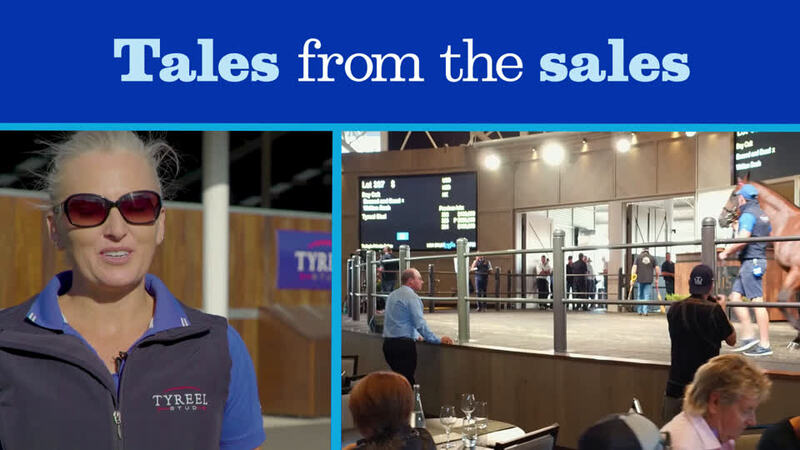 That’s not a snapshot of this week’s Inglis Australian Easter Yearling Sale –merely the outstanding results achieved by the Darley stallions. At a sale where questions on quantity and quality were being tossed around before the sale began, the Darley stallions emerged from two days of sometimes frantic buying with reputations enhanced. A total of 47 Yearlings by 14 Darley sires passed through the Inglis ring at a total cost to their buyers of a little more than $18 million. Exceed And Excel, Lonhro and Brazen Beau each set new personal records for their yearlings sold at auction. For Exceed And Excel, the top-price of $1.7 million paid for Lot 337, a colt from the Stakes-winning Written Tycoon mare Written Dash, topped his previous best by more than $400,000. The same mare produced Brazen Beau’s top-priced colt from last year’s Inglis Sydney Classic Sale. Offered by Tyreel Stud and purchased by Aquis Farm, the colt is from the family of G1 winner Sizzling and the Stakes-placed Masthead. The price was also a record for Tyreel. "He was an exceptional yearling and the busiest horse we have ever presented at the sales. People were just coming back day after day to come and see him," Tyreel's Linda Monds said. Aquis CEO Shane McGrath said the colt, one of 13 purchased by the farm, was one they’d fallen in love with. “At the end of the day you’ve got to buy the ones you love and he’s the one we loved,” McGrath said. The colt was one of 13 outright acquisitions for Aquis which resulted in them being the sale's leading buyer by both lots purchased and aggregate ($8,375,000). Exceed And Excel’s other seven-figure sale came on day one, Lot 137 a filly from the More Than Ready mare More Than Real. Offered by the renowned Kia Ora Stud and bought by Hermitage Thoroughbreds, the filly regarded as one the best few in the sale, is a half-sister to the Stakes-winning More Than Ready mare Miss Debutant and the winners Miss Imagination and Scorpio Sunset. The sales emphasised the reputation Exceed And Excel has established as the world’s premier sire of juvenile Stakes winners, and one that he added to only last week at Randwick with the Stakes wins of his sons, Microphone and Bivouac. Lonhro achieved his record price of $1.4 million as a 20-year-old and after 14 seasons at stud during which he has produced crop-after-crop of top-class horses. And he offers no reason why he shouldn’t continue to do so. Lonhro’s all-time best-selling yearling was Lot 416, a sister to the brilliant speedster Heatherly from the Danzero mare Dancing Heather. The filly was offered by Newhaven Park and purchased by Sheikh Mohammed bin Khalifa al Maktoum and helped her sire into third place on the overall sale averages at $603,000. Darley’s third million-dollar stallion, Brazen Beau, has been the hottest young sire in Australia for the past 12 months and confirmed that status with his best result to date – with some help from Exceed And Excel the sire of the colt’s dam Just Discreet. The colt catalogued as Lot 73 sold for $1.15 million to Orbis Bloodstock who also purchased the two highest-priced Brazen Beau’s at last month’s Inglis Premier sale. The sale ranks as the second best in more than 100 years of Inglis Easter yearling auctions with the 346 Lots sold grossing $122,795,500 and averaging $354,900.